Flamingos are a kind of bird that lives near lakes, mangrove swamps and mudflats. They are found in tropical and subtropical regions. There are 4 flamingo species in America and 2 species in Africa, Asia and Europe. The Greater Flamingo lives in parts of Africa, Europe and Asia. The Lesser Flamingo lives in Africa and Northwest India. The Chilean Flamingo are found in the Southern South America. James’ Flamingo and the Andean Flamingo are found in the high Andes mountains in Peru, Chile, Bolivia and Argentina. Lastly the American Flamingo are found in the Caribbean and the Galapagos Islands. Flamingos have long legs and webbed feet, a curved bill and a long curved neck. The legs are longer than the body, measuring between 80 to 125cm (30 to 50 inches) depending on the species. Their webbed feet help them to swim and stir up food from the bottom. They breathe air using their lungs. They will hold their breath while feeding under water. Flamingos often stand on just one leg and tuck the other leg beneath its body to keep it warm. This helps the flamingos to conserve body heat too, since they spend a huge amount of time wading in cold water. The tallest flamingo is the Greater Flamingo. They are 110 to 130cm (43 to 51 in) tall. They weigh up to 3.5kg (7.1lb). The Lesser Flamingos are the smallest flamingos. They are only 80cm (31.5in) tall and they weigh about 2.5 kg (5.5lb) only. For the Lesser Flamingos their wingspan ranges from 95 to 100cm (37-39in). The Greater Flamingos’ wings stretch out about 140 to 165cm (55-65in) from end to end. What a huge difference there is between the sizes of these two flamingos! Males flamingos are slightly taller and heavier than female flamingos. Their eyes are located on both side of the head. Flamingo chicks have grey eyes during their first year of life and when they are adult, they will have yellow eyes. An adult flamingo’s curvy bill is black, pinkish or cream-coloured, depending on the species. A newly hatched chick will have a straight red bill instead of a curvy bill. They eat shellfish, algae and small fish. Their bill is specially made to separate mud from the food they eat. The bill will be upside down when they are hunting for food. Inside the bill, there are some kinds of hairy structures along the lower jaw and their large rough tongue. These help it strain its food out of the mud and water. They drink fresh water. 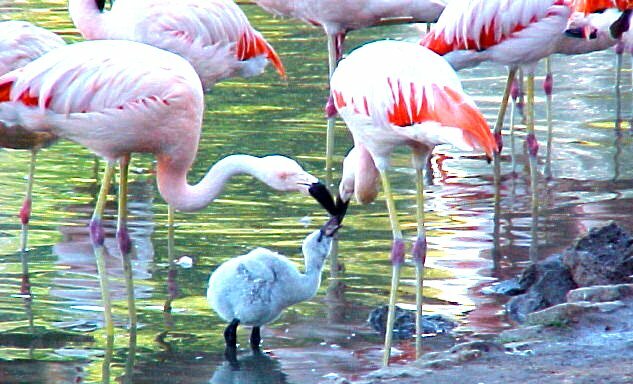 Young flamingos have layers of grey feathers, but the adults have feathers that vary from light pink to bright red. A healthy flamingo will have bright colours – a white or pale flamingo is usually sick or malnourished. They have some black wing feathers too. Flamingos live in groups called colonies. Each colony can have up to tens of thousands of flamingos. They live in colonies because of security, to catch more food, and to make full use of the limited nesting sites. Mum and dad will defend their nest. They will find a suitable spot on the mudflats to build their nest. The location is usually picked by mum. There are times, when other couples will try to steal the nesting site. However, flamingos will protect their nesting sites and young. Flamingos normally only lay one egg. The egg is about the size of a chicken’s egg. The egg is oblong in shape. It is chalky white. The parents will take turns sitting on the egg to keep it warm. The egg hatches after 26 to 31 days. Newly hatched chicks have grey or white feathers. Their parents are able to identify their own chick by sight and sound. Flamingos are noisy birds. Both mum and dad will nurse their chick. They will give the chick crop milk from their mouth. At about 7 to 21 days, the chick will begin to step out of its nest but it will still return to be fed. After two weeks, the chicks will join a group called a creche and start to hunt for food themselves. This creche contains thousands of chicks. Staying in a creche will keep the chicks keep safe from their predators. The chick will shed its grey feathers when it is between two to three years old and it will have bright beautiful pink or red feathers like mum and dad. Flamingoes’ eggs and chick are preyed upon by eagles, vultures, lions, leopards, cheetahs, foxes and jackals. Apart from that, humans have also destroyed their habitat by building roads, irrigation and mining. They are also hunted for their eggs. Fortunately, they are not endangered.